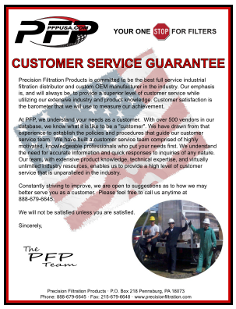 Performance Filtration Products is the manufacturing and automotive division of Precision Filtration Products. 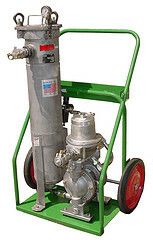 We are a U.S. based manufacturer of custom filtration products for both industrial and motor sports applications. Our goal is to be the best in the industry. Our mission is to provide the highest level of customer service in the industry. Coupled with our proprietary filter media and manufacturing processes, we deliver. From “Concept to Completion” we design and build high quality, high performance custom filtration products for our diverse OEM, resale, and end-user customer base. With an uncompromised history of supporting other U.S. based manufacturers and service providers, the motto “Buy American” is not just a slogan in our operation, it is our credo. We started our manufacturing operation out of necessity, when we could not find a manufacturer that could build the custom products that our customers were requesting, to our exact specifications and rigorous standards. We started by building a variety of custom filter discs for the plastics industry and exploded from there! Our custom product group that we now manufacture includes filter discs, filter cartridges, filter bags, and custom portable filtration systems. Constantly striving for improvement, we are vertically integrated to the point where our in-house capabilities include tool and mold making, welding, metal fabrication, gluing, ultrasonic welding, sewing, potting of PVC and urethane compounds. Our webpage highlights the high performance products that we build for the OEM markets in the motor sports industry. 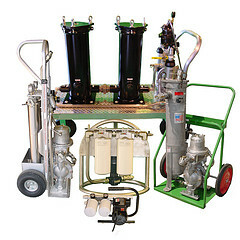 Our industrial product group can be found on our main website www.PrecisionFiltration.com. 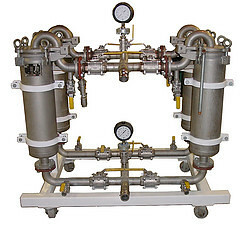 Whatever your filter or filtration needs may be, we can assist. As both a world-class distributor, and a vertically integrated custom manufacturer, our job is to provide the most cost-effective solutions to your most difficult filtration problems and projects. Contact us today and let us begin to help you reach your goals!